For current rates, please see our Rates & Regulations. Payments are due according to the chart below. 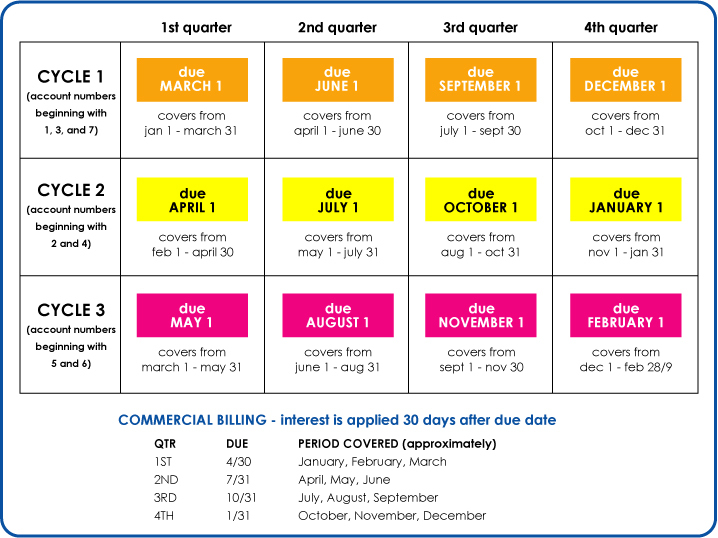 If you do not know which Billing Cycle you are in, feel free to call us and find out. Everyone in Pennsauken pays 3 Water/Sewer bills: (1) Pennsauken Sewerage, (2) CCMUA and (3) Water (Merchantville or NJ American) see FAQ page for more information. 1.5% Interest is added every month on the first of the month. Delinquent notices are sent out by the 10th of each month. 2 Quarters of non-payment will result in shut off of service. There is a non-negotiable $75 fee to restore service once it has been shut off. Once water is off, we cannot accept personal checks. Only cash or money order is acceptable. Payments must be received no later than 8 A.M. on the date of water shut off to avoid being turned off. If you cannot make it by this time, please call us to make arrangements. We can only help those who ask for it. Customers who do not meet payment arrangements will not be able to make arrangements in the future and will be expected to pay in full before the date of shut off with no exception. Only cash, money order or credit card will be accepted to turn water back on.